Introdu cing OUR NE W POKÃ&#x2030; BOWLS ! AUTUMN LOCAL & INTERNATIONAL CHEESES… Our hand-picked selection of local & international cheeses is so vast it can be almost overwhelming! Luckily we’ve a dedicated tasting station attended by cheese-loving demonstrators offering samples and recommendations, if you’d like some of either! LOCALLY GROWN APPLES... Did you know, since we opened the Farmers Market in 2003, we’ve never sold an apple that wasn’t grown in WA! Around the Easter Holidays we’ll have a variety of beautiful locally grown fruit including Buckeye Galas, Pink Lady, Fuji, Granny Smith, Bravo and Kanzi. FINEST FRESH FISH… If you fancy some local fresh fish for the holidays, short of catching it yourself, it doesn’t get much fresher than the Farmers Market Seafood fridges! There’s a selection of fresh WA whole fish & fillets available 7 days a week, plus an extensive range of RSPCA approved Huon Salmon. 1. Place 1 tablespoon of yoghurt into each ice-cream silicone mould. Add a sprinkle of granola and a couple of blueberries and raspberries into each one. 2. Insert a paddle pop stick into each compartment, laying it down as flat as possible. 3. Fill each ice-cream mould to the top with yoghurt, covering the berries and the paddle pop stick. 1. L  ine a medium sized baking tray with baking paper. 2. E  venly distribute raspberries, cranberries and coconut flakes over the bottom of the tray. 3. In a small pot, heat the coconut oil, butter, vanilla extract, maple syrup/honey and cacao until melted and mixed through. 4. P  our chocolate mix over the top of the ingredients in the baking tray. 5. P  lace baking tray in the freezer for 40 minutes, or until chocolate is set hard. 6. B  reak into random sized pieces and serve as a delicious sweet chocolatey treat. 4. Add moulds to the freezer and freeze for 2 hours or overnight, until the ice-creams are frozen through and solid. 5. To serve, pop out of the moulds and allow to sit on a plate at room temperature for 2-3 minutes to soften before eating. 6. Popsicles will keep well if stored in an airtight container in the freezer. Optional For coloured Ice-creams, blitz the raspberries and blueberries in a blender for 5 seconds, before adding to yoghurt. Mix through allowing the natural colour of the berries to colour the yoghurt. If you want blue and red ice-creams, just blitz the raspberries and blueberries separately and add to 2 different bowls. Evenly distribute yoghurt between the 2 bowls before stirring through. Add 1/3 cup of your favourite nuts, roughly chopped to the mix for a delicious crunchy texture. I like macadamias and pistachios. You will need: Ice-cream silicone mould or muffin cups and paddle pop sticks. PERFECT FOR PICNICS AND HEALTHY EATING ON THE GO! Whether you’re heading down South for a break, to the beach for a picnic, or you just fancy a healthy option for lunch on the go, you might like to try our new Poké Bowl range - there are six ready-to-eat Poké bowl flavours to choose from in our Cafe Fridges. Like all 100% Market Made products our Poké Bowls are freshly made, on the premises, every day using the finest Farmers Market ingredients - that’s why they taste so good! AVAILABLE IN THE CAFE FRIDGES - READY TO EAT WHEN YOU ARE! 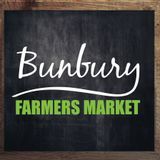 Online Catering by Bunbury Farmers Market If you’d like to lay on a spread with Farmers Market food but you don’t have the time or facilities to put it all together, have a look at the Made to Order online catering service on our website www.buburyfarmersmarket.com.au/orders There you’ll find a range of Market Made platters, quiches, salads, desserts, hampers and flowers you can order in advance and collect in-store. Orders can be placed far in advance or up until midday the day before collection, making this a deliciously convenient way to cater for family get-togethers, garden parties, client meetings, or any other gathering. You may recognise Adam from the Gourmet Butcher Counter - alongside the rest of our skilled butchers, Adam prepares & presents the dressed gourmet meat products you can feast your eyes on at the Farmers Market. Aileen looks after the Fresh Cuts section of our Market Made range - she and her team of chefs freshly prepare our Salads, Sliced Fruit Trays, Stir Fry Packs and Poké Bowls every day so they’re as deliciously fresh & tasty as can be. Jason is one of the talented onsite bakers who make & bake our entire range of Market Made baked goods. We hand make an exceptional range of loaves, rolls, biscuits, muffins, baguettes, garlic breads and so on, 7 days a week. If there's a 100% Market Made sticker on a product at the Farmers Market, what does that actually mean? By our cooks & chefs! With quality ingredients! SAUCES & MARINADES Add a little more flavour to your BBQ plate with our delicious range of handmade Sauces & Marinades - available near the Market Made fridges! FRESH SALADS! 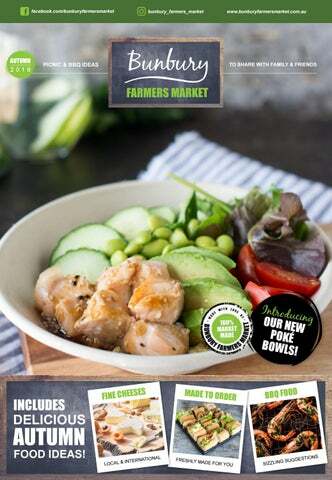 Our Fresh Cuts Salad packs and new Salad Bowls make the perfect accompaniment to whatever you’re cooking on the BBQ, not least because they’re ready to serve whenever you are! If you’re in the mood for a BBQ you’ll find everything you need at the Farmers Market - whether you want top notch meat, sauces & marinades or prepared salads, it’s all here for the taking! Whether you choose a value pack from our meat fridges or something a little fancier from the Gourmet Counter, you just can’t go wrong with our range of Harvey Beef Rump Steaks! Our freshly prepared Butterflied Lamb is a particularly popular choice for BBQing - it’s a tasty alternative to a classic steak and a real crowd pleaser! Our Market Made Gourmet Sausages are handmade by our onsite butchers with quality whole food ingredients and no fillers - try them and taste the difference! Like all the Market Made chicken products available at the Famers Market, our BBQ Chicken Sticks are freshly made onsite using Free Range Chicken. …a medium to large apple with a crunchy bite and well-balanced sweet & sour flavour derived from its blend of a juicy Gala and a tangy, sweet Braeburn. Our Perth Hills grown Kanzis have a firm white, fragrant flesh with a crunchy and slightly effervescent texture. ...are slightly sweeter than other varieties and are great in salads, pies and sauces. With it’s firm-textured, crisp and juicy tasting, extremely dense flesh, many consider Fuji to be the perfect eating apple. …is a hard apple with a crisp tart flavour perfect for baking, freezing, salads, sauces and pies. This is one of the best cooking apples with a sensational tart, tangy flavour. When fully mature the sweetness level of this popular apple increases. Here’s a quick guide to the apple varieties you’ll find at the Farmers Market, depending on seasonal availability. …a unique Western Australian bred apple that has a distinct sweetness, moderate to high crisp and crunch, and a striking burgundy colour. They’re fresh tasting with a balanced flavour and an attractive contrasting creamy yellow flesh. ...a large apple with a firm, sweet, crisp juicy flesh which makes it excellent in salads, sauces and pies. Otherwise known as the Queen of apples, the Pink lady has an almost effervescent flavour. …are medium in size with a sweet flavour, ideal for pies, sauces and salads. Royal Gala are characterised by a blush of pink of the skin. The colour varies from yellow to almost orange with deep orange stripes. Gala is a small, round, sweet apple that is ideal for children’s lunch-boxes. We’ve been sourcing our apples from The Omodeis in Manjimup for over a decade because we believe in the ongoing support of the local growers we’re so fortunate to have on our doorstep. The Omodeis have been growing superb fruit for a lifetime and what they don’t know about growing apples isn’t worth knowing! Try their crisp, sweet Galas on your next visit to the Farmers Market and you’ll see what we mean. Our delicious Fruitico grapes are grown in vineyards just south of Pinjarra. This is where owners Roger & Liz Fahl (and their team) spend time pruning, snipping and covering their grapes to optimise the size, quality and taste of their fruit. At Fruitico the grapes are harvested at the very moment their flavour peaks, which is why popular autumn crisp green grapes are like a "sweet, fragrant taste explosion in your mouth." Daily FRESH FISH Did you know we take delivery of fresh Australian & New Zealand seafood 7 days a week at Bunbury Farmers Market? Our range includes some of the finest wild caught and sustainably farmed fresh fish you’ll find anywhere in the country. Our West Australian Tiger Prawns are wild caught, freshly cooked, and never frozen. They’re perfect for BBQ’s, salads and dipping and you can really taste the difference when you try them. FRESH OYSTERS & MUSSELS: If you’re partial to shellfish, you might like to try our Fresh Oysters from Tasmania and our Fresh Live Mussels from South Australia; they’re always available in the seafood fridges and they’re always deliciously fresh! We take delivery of fresh fish every day at the Farmers Market, so no matter when you visit, you’ll always find an extensive fresh fish selection in our seafood fridges. HUON SALMON: You’ll find Fresh RSPCA Approved Huon Salmon in whole fish, side fillets and value added portions at the Farmers Market. We fly our stock in 3 times a week to ensure the optimum freshness of this exceptional tasting fish. Hand Picked LOCAL & IMPORTED CHEESES The selection of cheeses available at the Farmers Market is surpassed only by our knowledge of them. So, whether you’re looking for a local favourite or something with an international flavour, we’re here to help with recommendations & tastings. with a sweet, slightly nutty character. Imported FRENCH CHEESES Did you know that in addition to stocking an impressive selection of popular Local & Australian Cheeses, we now also directly import a fine range of French Cheeses each and every month! Ask our demonstrators about our Vacherousse, our Cremeux, or our 6 and 12 month aged Comte on your next visit to the Farmers Market - they’re quite something! If you’ve ever wondered why our 100% Market Made food & drinks taste so good, this illustrated map showing the floorpan of the entire Farmers Market building will help explain. 	We make sensational tasting fresh food (and drinks) with quality Farmers Market ingredients. We put in the time & effort in our kitchens so you don’t have to. We make our food the right way so you can enjoy meals with real nutritional value. 	Every one of our ever-expanding range of Market Made products is lovingly prepared for folks who value taste, time and nutrition. Look at the map closely and you’ll find the locations of the onsite kitchens where we prepare, cook, bake, press, dress and package over 100 unique Market Made products. 	Every product wearing our green & black Market Made sticker is freshly made, every day, right here on the premises using the best Farmers Market ingredients.